This fortnight Patter has shared a song I had never heard before and the words are good ones. Please visit Patter's blog HERE so you can read what she has shared and also visit the links to the song. The line in the song "My God will come through always" stood out to me. Maybe because in life even our loved ones do not always come through for us but how wonderful to know and believe God does come through ALWAYS. 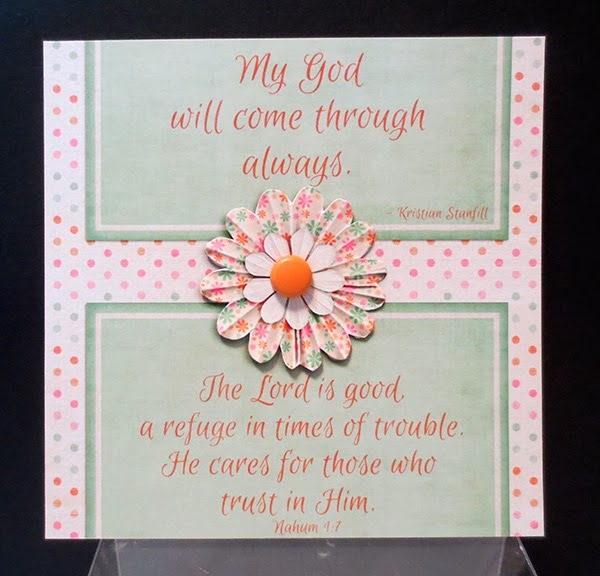 There are so many wonderful scriptures to remind us that He is our refuge and our strength. For my little piece of artwork which is mostly digital - I photographed it because scanning it did not give a very good result - I printed an extra flower to attach to give a more realistic 3D effect and added a real brad to the centre. Lovely page and such a good scripture to hold on to in times of trouble. A beautiful page . lovely colours and I like the flower giving extra dimension to your digital page .